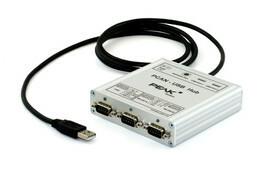 The PCAN-USB Hub provides multiple hardware interfaces through a USB connection. It offers the user one CAN, two RS-232, and two further USB interfaces. Its robust aluminum casing makes the PCAN-USB Hub suitable for mobile applications.